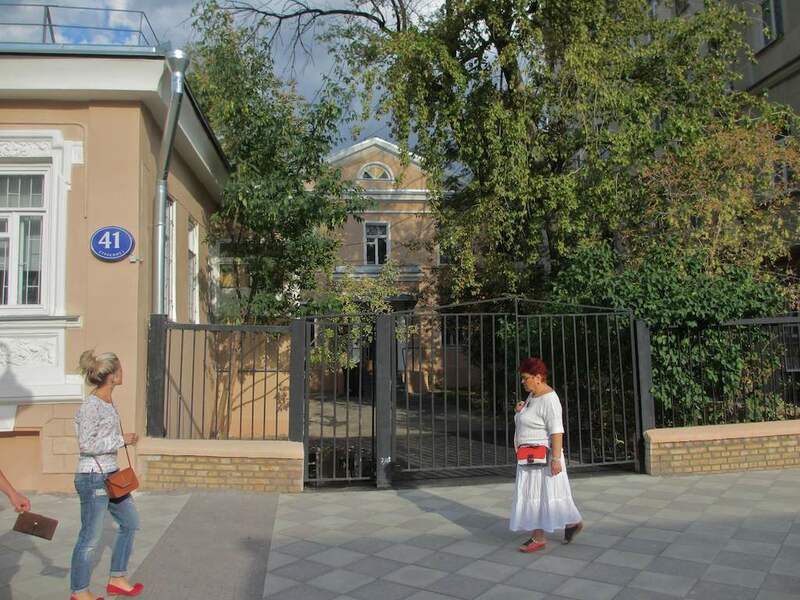 Still another point of interest on the newly renovated Pyatnitskaya Street. 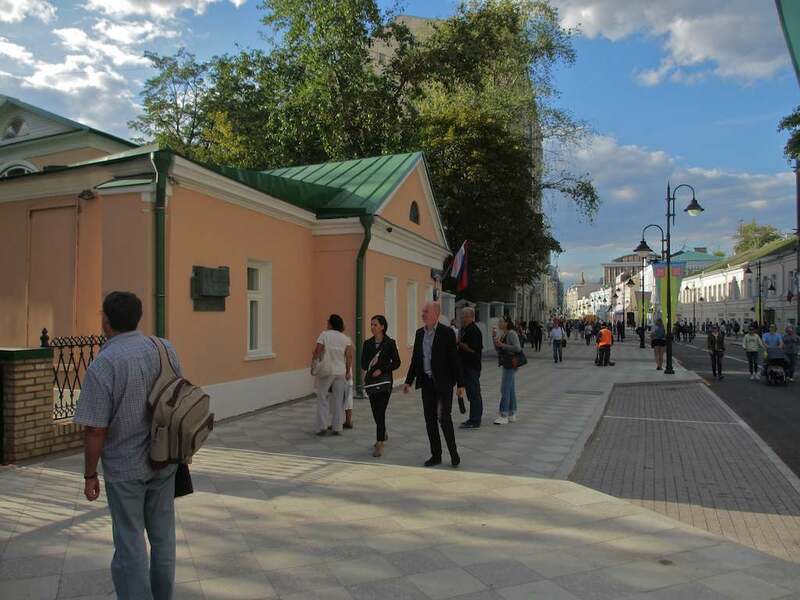 Look at the luscious new peach-colored paint on the wall around the plaque proclaiming this modest building at 12 Pyatnitskaya Street the Lev Tolstoy Museum and the Tolstoy Center on Pyatnitskaya. 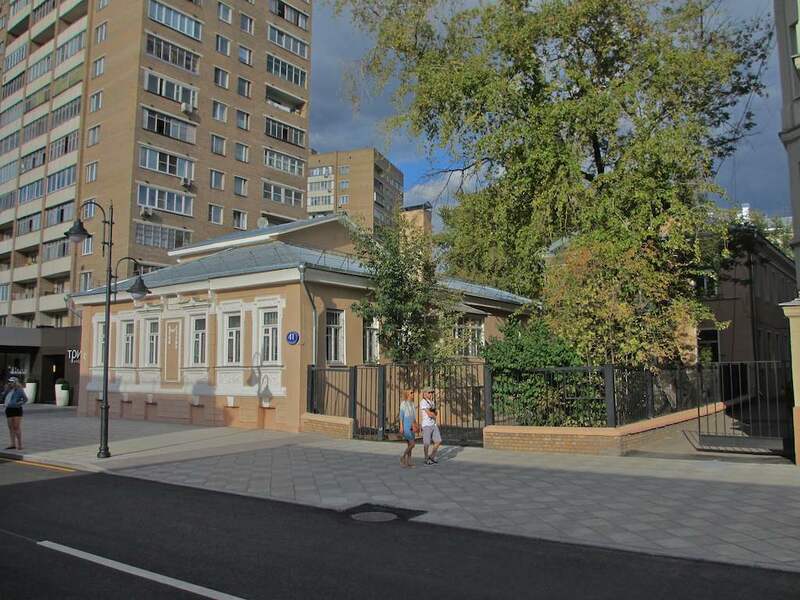 According to one laconic, but fact-filled website, this was just one of 22 homes that are associated with the great writer’s life in Moscow. 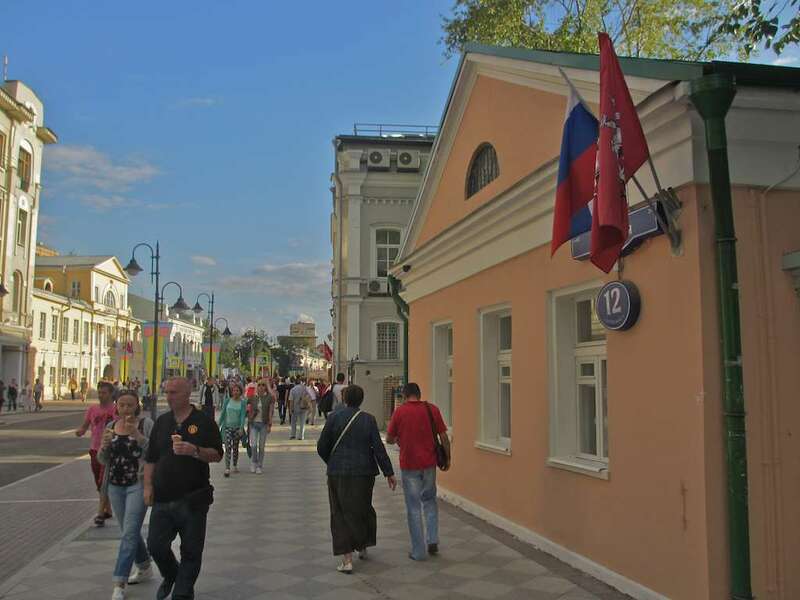 Tolstoy rented rooms here from October 1857 to the end of 1858 after returning home from the Crimean War. According to the museum’s website, the building was originally erected between 1789 and 1795. 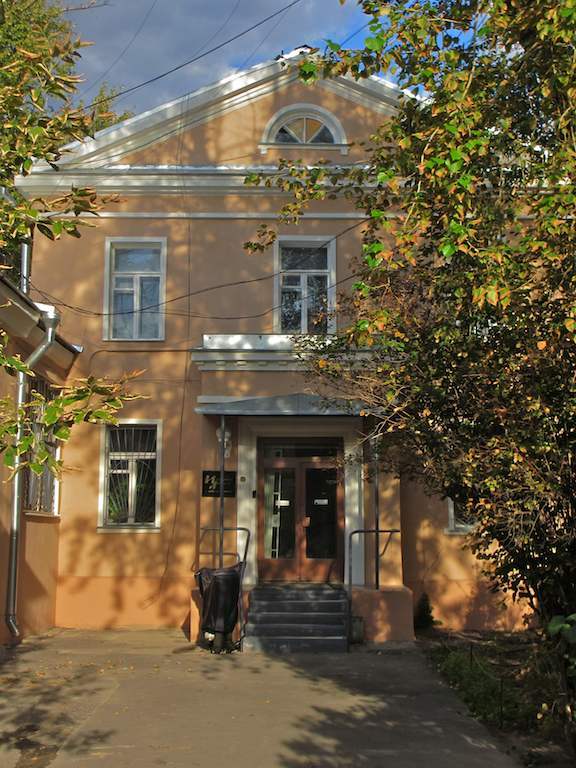 While renting furnished rooms here Tolstoy lived with his brother Nikolai, his sister Maria and three nephews, and he also became friends with the poet Afanasy Fet and the playwright Alexander Ostrovsky, the latter of which who lived a stone’s throw away. 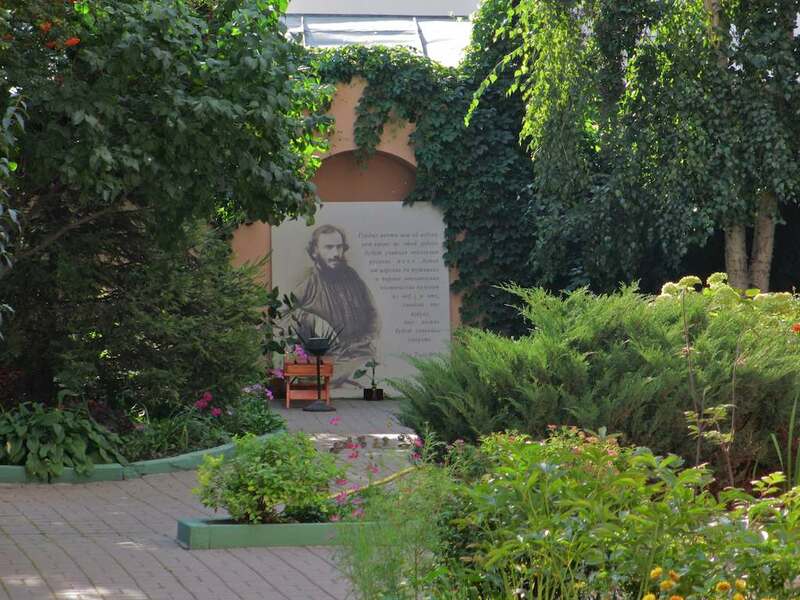 As the site tells us, Tolstoy routinely received such guests as the satirist Mikhail Saltykov-Shchedrin, the historian, lawyer and philosopher Boris Chicherin, and the Aksakov brothers, Ivan and Konstantin. While Tolstoy lived here he worked on his famous novella The Cossacks, as well as on the stories “The Perished (Albert),” and “Three Deaths.” Some sources indicate he also wrote his tale “Family Happiness” here. It would make sense since all these works were written at more or less the same time. Chances are, the church Tolstoy saw the old woman entering was the Church of Paraskeva Pyatnitsa, for which the street is named. 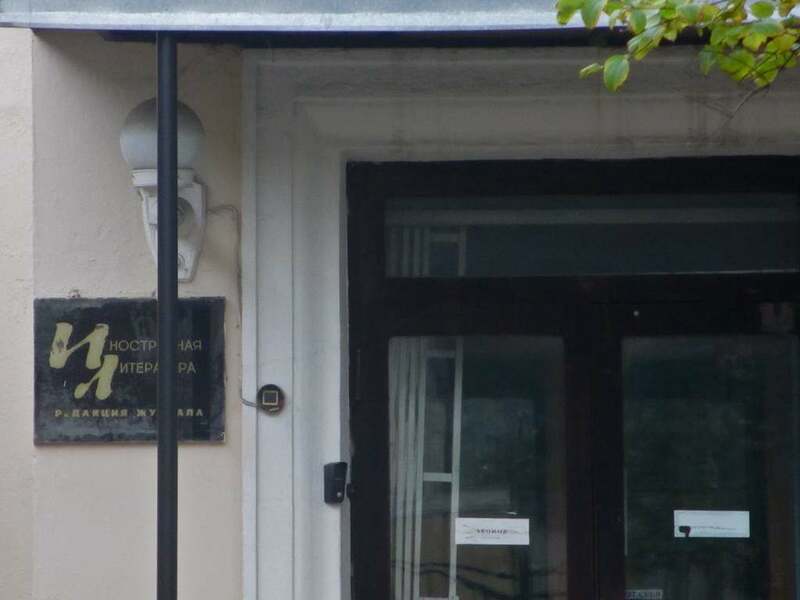 It would stand for another 70+ years just south of Tolstoy’s house on the other side of the street until it was destroyed by Joseph Stalin in the 1930s. As for the “bells of churches wafting in” – it must be remembered that there are numerous churches in this area and bells from most of them would easily have reached Tolstoy’s ears. Especially in the quiet state of solitude he describes in his tale. 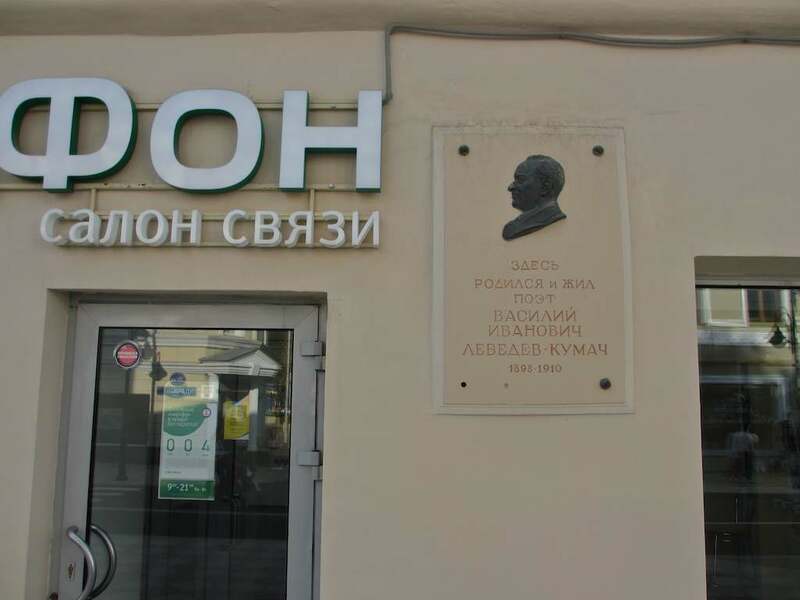 For those who love irony (and a bit of stupidity, perhaps), consider my previous post on the Tolstoy museum on Prechistenka and my story about never having visited that location in my 25 years in Russia. 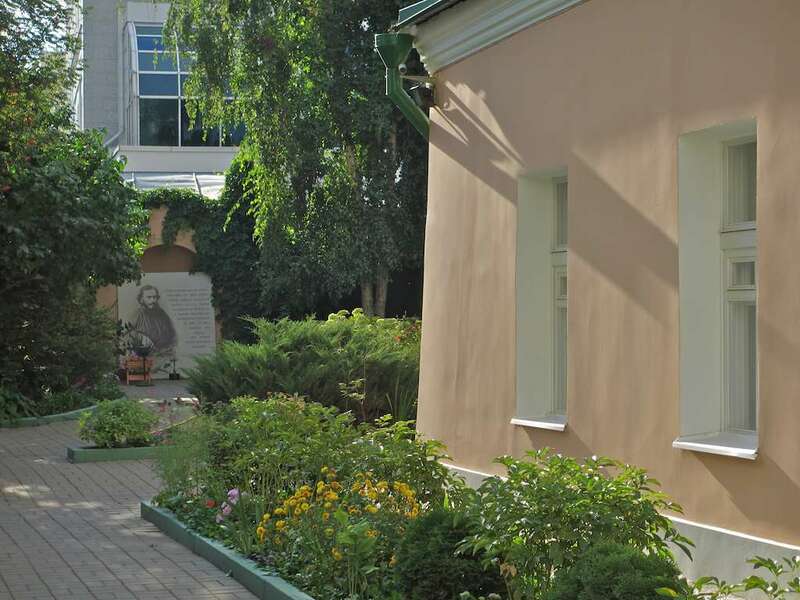 We can now add to that the fact that I have lived on Pyatnitskaya Street for 15 years and have never visited the Tolstoy museum located just a mile or two away from me. I can’t explain why that is. So I won’t try. I will get there, though. I promise. 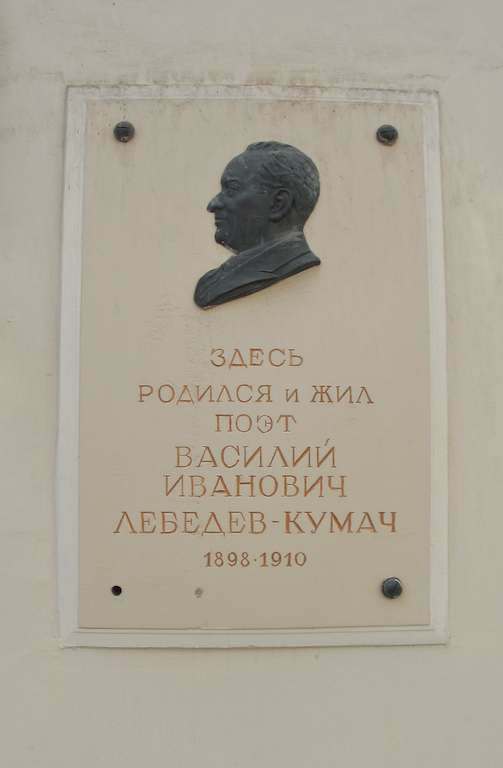 We continue our stroll up and down Moscow’s renovated Pyatnitskaya Street today by turning our attention to Vasily Lebedev (1898-1949), a poet and song lyricist who, during the period of the Revolution, added the appendage Kumach (calico red, turkey red) to his last name. He was born at No. 6 Pyatnitskaya Street and lived here more or less until his 12th birthday. Lebedev-Kumach is a wonderfully evocative name in Russian, with hinted references to swans and turkeys, white and red. I used to run across his name often when researching my book Silence’s Roar: The Life and Drama of Nikolai Erdman. Not only did the two writers begin their careers at approximately the same time (Lebedev-Kumach preceding Erdman by about two years) and in the same general circles, but they had the opportunity to collaborate several times in the 1930s. Lebedev-Kumach wrote the songs for three works that Erdman collaborated on with others. They were: The Musical Store (1932), a musical/dramatic sketch written with Vladimir Mass for the popular jazz musician Leonid Utyosov; Jolly Fellows (1933/34), a film scripted with Mass and based very loosely on the idea of The Music Store; and Volga-Volga (1938), a film scripted with Mikhail Volpin. Lebedev-Kumach was a hugely successful figure in the Soviet pantheon. He was the winner of a Stalin Prize (1941) and his songs were wildly popular, bringing him a financial security that could not be dreamed of by the average person in the workers’ paradise. It’s enough to know that he was the author of the words to the once- song “Wide is My Native Land” to understand the scope of the writer’s fame. 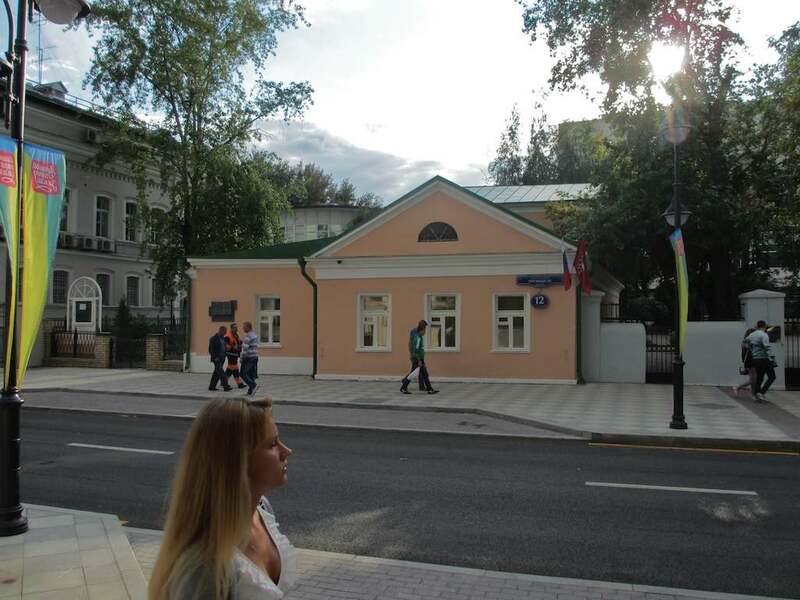 The building in which the future poet and song lyricist was born is one of the oldest buildings on Pyatnitskaya Street. In the second half of the 19th century it either replaced a one-story building that was built in 1842, or had a second floor added. 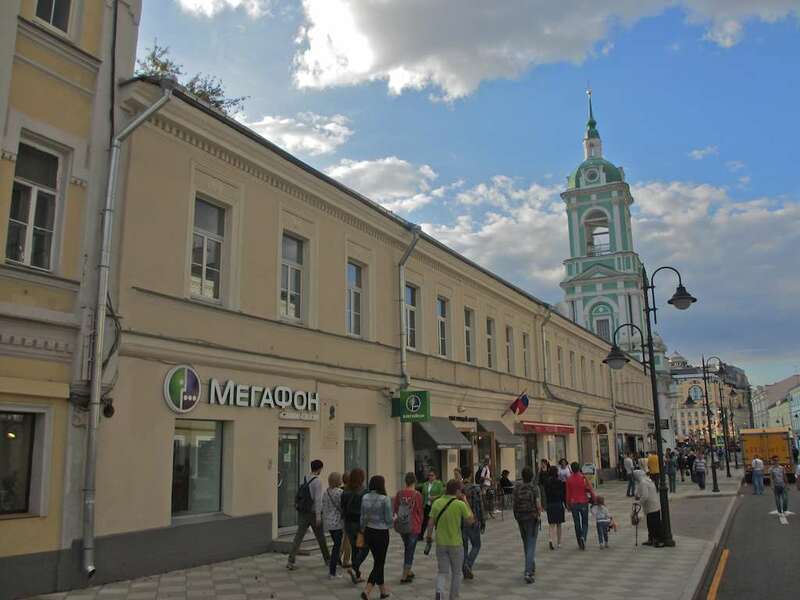 As best as I can understand, the one-story version was erected at the end of the 18th century and replaced structures that were part of the property of Count Mikhail Dashkov in the 17th century. As for Lebedev-Kumach, I would add that he translated Horatio into Russian; worked for a time in the organization connected with the famous ROSTA Windows (where Vladimir Mayakovsky also worked); wrote for the great humorous publications The Whistle (Gudok) and Krokodil; and took part in the famous and influential Blue Blouse traveling theater projects. According to one website, an incomplete listing of his songs numbers more than 150. He is buried in the cemetery at Novodevichy Monastery. 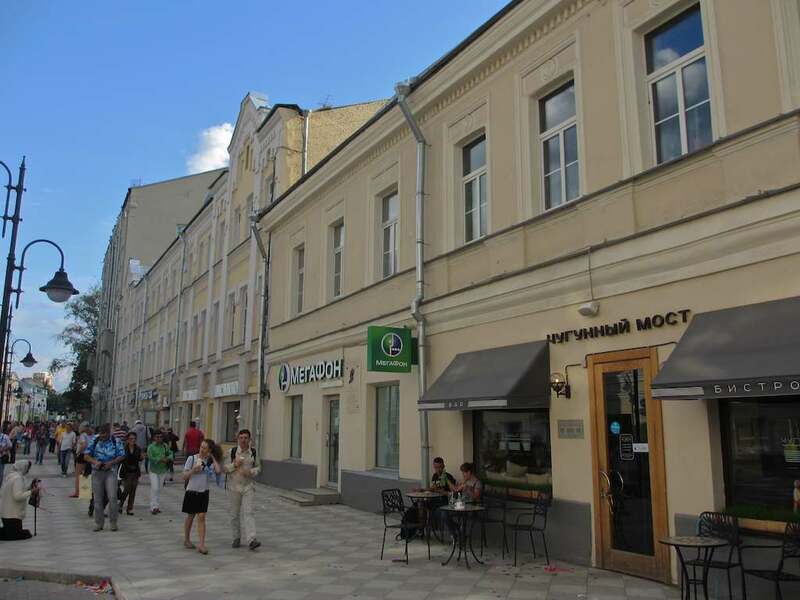 I live on Pyatnitskaya Street in Moscow in the Zamoskvorechye, or “Beyond the Moscow River” section of the city. It is a glorious place, filled with churches, old architecture and cultural connections. It is, at once, the old merchant section of town and the place where, hundreds of years ago – and today, too – immigrants from the South would arrive and make their home. 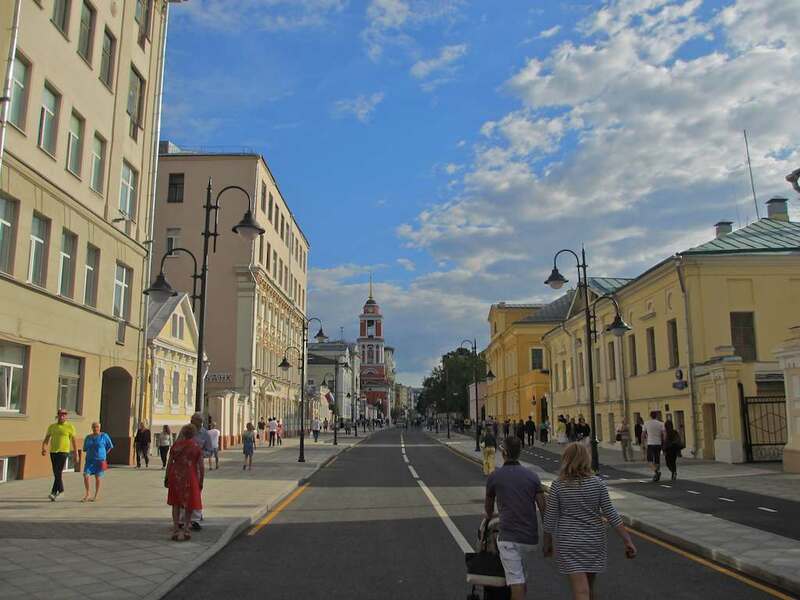 Over the last two months Pyatnitskaya Street has undergone a radical facelift, old buildings being renovated and repainted, the street being narrowed for automobiles and widened for pedestrians and bicycle riders. The neighborhood has undergone a transformation of a kind I have never experienced in any neighborhood I have ever lived in – and I have lived in a lot of neighborhoods. When I married into the Mysin family in the late 1980s, the huge library I inherited, indeed, included large packs of old issues of Inostrannaya literatura tied together with coarse string. We donated these old issues to the Russian Theater Union’s research library when we moved 15 years ago. 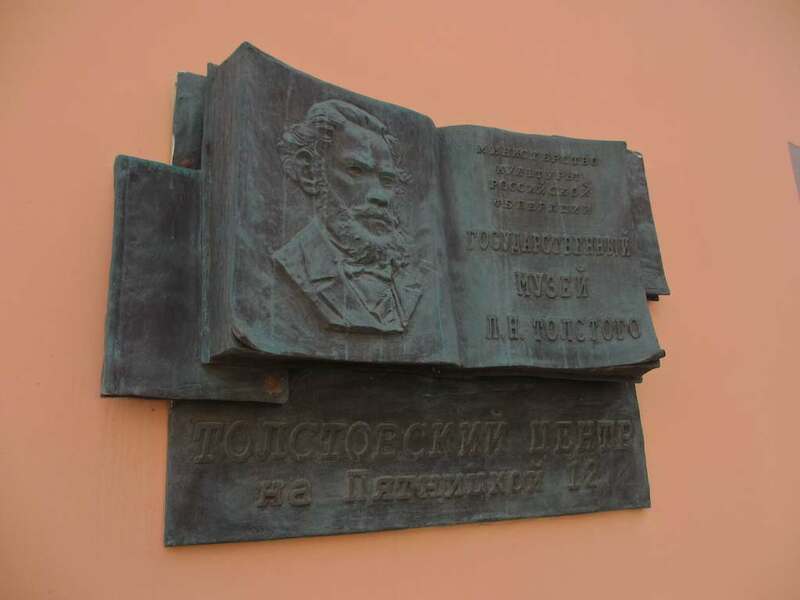 Inostrannaya literatura was one of the great promoters and defenders of the art of translation in a national tradition, both Russian and Soviet, which has always excelled in this sphere of belles lettres. Translators in Russia have been revered almost as writers themselves, and, in fact, often have been major writers in their own right. The names are legion, but we can mention a few – Samuil Marshak (see my post from a few weeks back), Kornei Chukovsky, Boris Pasternak, Joseph Brodsky, Vasily Aksyonov, Innokenty Annensky, Dmitry Merezhkovsky, Fyodor Dostoevsky, Alexander Pushkin… You get the point. Inostrannaya literatura these days often publishes the magnificent work of translator Natalya Mavlevich, who functions equally at ease in French, German and English. Mavlevich created one of the finest translations I have ever encountered – a virtuoso rendition of Valere Novarina’s experimental masterpiece L’Operette imaginaire, although this was not published in Inostrannaya literatura. 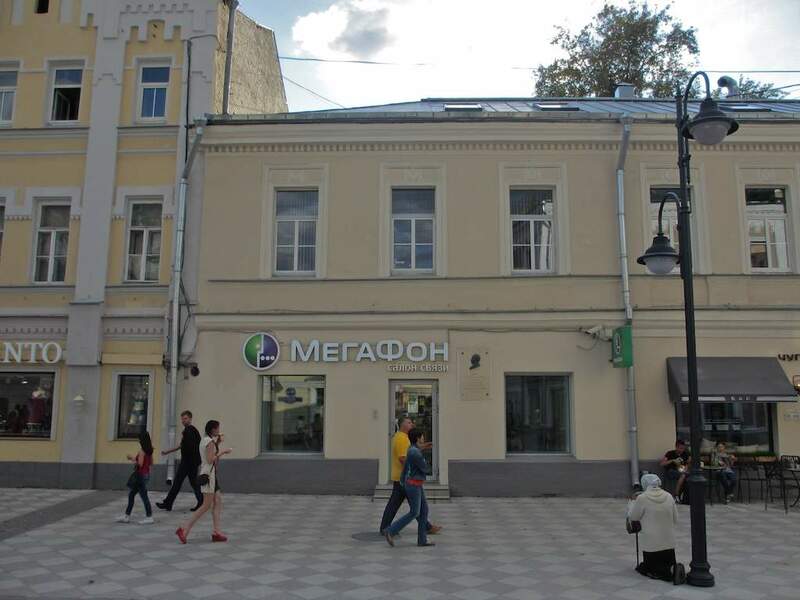 In the photo immediately below you see the journal’s editorial office as pictured from the opposite side of the street, while the final photo shows a view of Pyatnitskaya Street looking south from directly in front of the building. What I was leaning on was my memory from the late 1970s of going into writers’ organizations and other non-bookstore places where, indeed, books that the average person could not find in bookstores were there for the “elite” members of these places to buy. So I may be wrong that books were for sale at magazine editorial offices, but my reference was wider. That said, I’m more than happy to provide these corrections.